Munuscong Potholes is a tiny sparkling gem at the eastern edge of Michigan’s Upper Peninsula. I discovered it this spring while searching for Le Conte’s Sparrow to record. 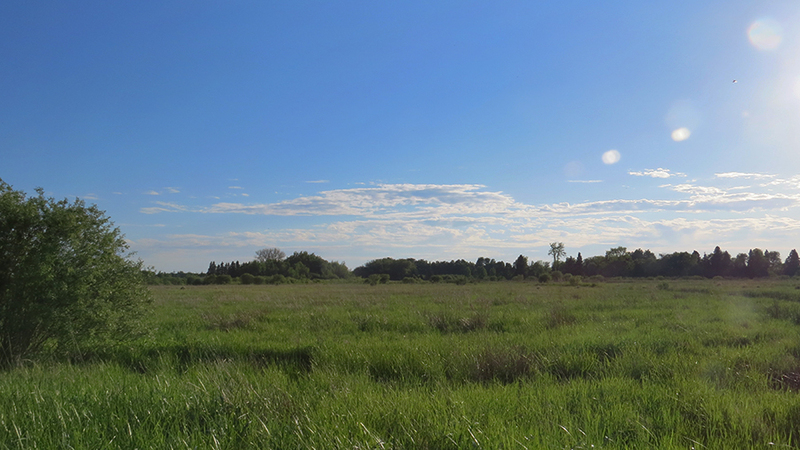 It is only some 30 acres of wet sedge meadow surrounding a couple of small, cattail-lined ponds. The soundscape was populated by Red-winged Blackbirds, Sandhill Cranes, several different sparrows and, to my surprise and delight, three American Bitterns! Bitterns are notoriously difficult to film and record. They are skulkers, preferring to hunker down in the vegetation or stand reed-thin and stock still in the cattails. And their call, while low-pitched so as to travel far through the marsh, has a ventriloquistic effect that makes it hard to locate. I was fortunate with this bird in that I was able to follow it over the course of an hour, moving ever closer, hiding behind shrubs, and standing motionless for long periods. I have always been drawn to this bird, partly due to its odd behavior when threatened (extending its neck, head, and bill upwards in imitation of the reeds), but mainly because of its iconic call and the quaint vernacular name “thunder-pumper” that is derived from that call. Shortly after I shot this video a second bird flew past, low overhead, and landed at the edge of a pond some 100 feet away. “My” bird flew after it, landed close by, and walked slowly behind it into the cattails. First date? Mated pair? I never found out. This Miracle of Nature video features an American Bittern calling in a wet sedge meadow in mid-June. Munuscong Potholes Wildlife Management Area, Michigan. By Bob McGuire. Hi neighbor!—(after appearing on “Mr. Roger’s Neighborhood,” I am allowed to say that). My name is Bob. Following my careers as a classroom teacher, artist, and welder, I have settled into the role of field biologist and nature sound recordist. I am happiest of all outdoors, whether sailing, skiing, hiking, cycling, or counting birds. My wife got me into birding a decade ago, and now I wonder why I waited so long. I am especially interested in the variety of songs and calls associated with bird behavior and look forward to featuring the best of my field recordings and photographs on the Miracle of Nature web site. Awesome. What fun that must have been to be so close to a singing Bittern. Those certainly sound like “clicks” to me. My best reference, “Birds of north America” online, mentions, under “non-vocal sounds”, “Series of bill clicking and gulping sounds preceding each bout of pump-er-lunk calls”. “bill clicking and gulping” … yes, listen carefully, the introductory clicks are loud and high-pitched, but there are also simultaneous low-pitched sounds that probably are made by the actual gulps! You can do it with your own mouth … make a gulping sound and also click your teeth (but take care not to crack your teeth!). The loud clicks at the beginning are made as the bittern gulps air to inflate his esophagus, which helps add volume and resonance to his call. It sounds like the clapping of his bill, but I’m not sure if that’s true or not. Bob … did you check the Bird of North America monograph about the details of the call?